When you think about it, many of life's daily tasks — from remembering names and birthdays to recalling shopping lists — are really just memory games. At the end of the day, the aim is to memorize and recall lists — lists of words, names, dates, places or facts. A big part of my mission here at Word Buff is to interrogate expert memory game players to find out how they do these things. His name is Ron White, and I've spent the last month or so reviewing Memory in a Month, the training system Ron created to show you how to improve your memory through games. 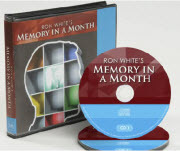 Firstly, Ron has packaged his Memory in a Month course as a digital product. That means you download it over the Internet, and you won't be receiving anything in your 'real' mailbox. The great thing about that, of course, is that you get instant access to the system right when you're at your most excited! But if you're new to the whole digital download thing, please make sure you read my comments about the process (in the section on 'Negatives'), as it might save you some time and pain. 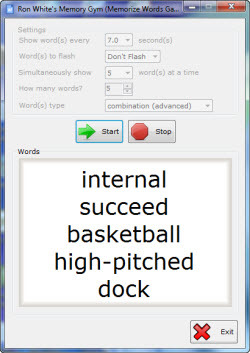 Secondly, this program comes with an equally extensive Speed Reading course. I'm not particularly interested in speed reading, and it isn't really relevant to this site, so my review only pertains to the Memory material. Finally, Memory in a Month is distributed through the 'Amazon' of digital product stores. It's called ClickBank, and you won't have any trouble whatsoever getting support, or even a full refund, if you're not happy with anything. Since starting this site a couple of years ago, I've interviewed lots of expert Scrabble players, crossword solvers, and spelling bee champions, hoping to find out exactly how they have turned their brains into massive storehouses of words and facts. One thing is clear. They do not have photographic memory! The problem is, I find all these tips and tricks a bit ad hoc and disorganized. What I found myself asking was whether or not there was a common thread to all these techniques - a generic and systematic approach to memorizing lists that can be adapted to any purpose whatsoever. In other words, I wanted a memory system that doesn't care whether I'm trying to learn a list of Anagrams, State Capitals, Names & Dates, or a Shopping List. And that's how I came across the name Ron White. Unlike most experts I've interrogated here at Word-Buff, Ron White is not a champion at word games, specifically. He's a champion at memory games. And that means he has perfected the art of list-learning in its most general and powerful form. So this is the background against which I decided to undertake this month-long review. In addition to this core, is a set of video demonstrations of the techniques in action (from one of Ron's training seminars), and a full speed-reading program (which, as I mentioned at the start, I haven't reviewed). The essence of Ron's system is to take advantage of the fact that our brains operate best with pictures, and that wherever possible we should replace words, numbers, and abstract ideas with images. These images are then glued together into memorable stories which can easily be recalled and decoded at whim. The magic of Ron's approach is not so much the emphasis on pictures, which he freely concedes has been around for centuries, but rather the way in which he has fleshed this principle out into a detailed, comprehensive, and easy to learn scheme. 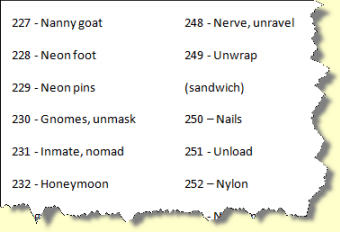 You see, if you just haphazardly create picture-stories to remember lists, you might find it works just fine for a small number of lists, but very soon you'll get yourself totally muddled. What's needed is a systematic image-association scheme that you always use to build your stories. That way, after a while it becomes second nature and you actually start to process sensory data in images. This association scheme needs to be extendible, so that you can keep enlarging your lists as you get better at using it, flexible, so that you can use it for all kinds of lists, and intuitive, so that you can master the 'skeleton' framework easily. I've come to loooove that guy! Although the program is billed as a 30-day program, you shouldn't take that too literally. The lessons are only short, and you should only need an hour or two a day to master them. It is really important that you actually master them though. The lessons build on each other in a clever way, and if you haven't committed the basic framework to memory, you just can't extend it. This is a huge memory training program. There are megabytes upon megabytes of information in the package. When all is said and done, that is obviously a good thing - I mean nobody in their right mind will complain that they didn't get value for money here. But downloading the package was not as smooth and seamless as it should be nowadays. I'm not sure if it was because I'm using Windows 7, but the simple download process didn't work properly (some of the files couldn't be opened). Fortunately, you automatically receive an email with a link to an alternative process, just in case this very thing happens (so it must happen quite often), but in my excitement I overlooked that follow up email and wasted time trouble-shooting unnecessarily. Ron is a very natural and upbeat speaker, but I felt he got a bit carried away with his enthusiasm sometimes. In some instances he becomes almost evangelical (which was fun in the video above, but it wears thin after a while) and at other times it sounded a bit contrived (such as starting each video by telling us how great he feels). Of course, none of this detracts from the quality of the content itself, but I just mention it because it did grate on me a bit. If you don't live in America, you're going to feel a bit left out in a couple of sessions. It's nothing essential to the program or anything, but his examples often come from American geography and sport (he's clearly obsessed with baseball) and that can alienate non-Americans (yes, they are out there somewhere). In a product that's being sold over the Web, that strikes me as a pretty obvious marketing error. Ron's choice of logical structure was excellent. He starts with something extremely simple, and then builds upon it all the way through to the final day. Only towards the end do you look back and see how powerful the original idea was, and how everything else ties together into an integrated whole. Most of the lessons are really quite brief (I think they amount to six or seven hours in total). The great thing about this is that everything is interesting and punchy, making it very easy to focus and take it all in. It also means that you tend not to procrastinate because you know that you're only committing to a short tutorial. If anything, this had the opposite effect on me, making me want to plow through the whole program in a single sitting! Of course, if you do it this way, you should really do it a few times through. The thing is, Ron really doesn't have to share his personal code tables with us - he could very easily describe the system, give us a few examples, and then tell us how to build our own tables (actually, that's what several other systems do). This generosity saves us an unspeakable number of hours of trial and error. Whatever you do, don't forget to download these three small documents (which, by the way, in my frustration I almost did!). Ron throws in a set of bonus training videos to watch when you've completed the program. Everybody likes surprise freebies so I won't spoil it by reviewing them, except to say they were really useful demos for consolidating everything. I think what excited me most about this memory training program is how flexible the method is, if you're creative enough. Well, fortunately we don't have to be all that creative because Ron provides the basic formula for applying the system to a huge range of situations. For example, if I had been shown this memory technique and then asked to use it to memorize a long list of locations or directions, I wouldn't have known where to start. Ron's trick for doing this is really clever. Over the years, I've found so much great free stuff on the Web that I'm really reluctant to pay for it. I only do so if there is nothing that comes close on the freebie market AND if it is actually used by experts in the field. Ron's Memory in a Month program certainly passes this test with flying colors. But how well does it work? Well, please don't think of it as an easy system to master exactly. 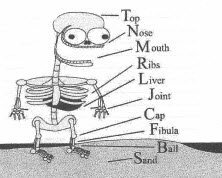 It takes a fair bit of time and effort to cement the skeleton in your mind. 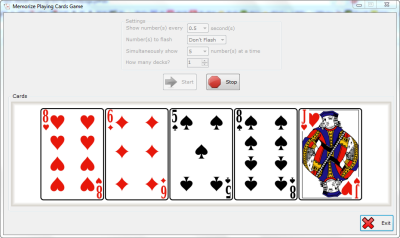 But the thing is, using memory games to learn the system makes it feel like play rather than work. To do this, I put together three lists I wanted to learn - one for Scrabble (a list of 50 obscure words), one for Crosswords (the currencies of 63 countries), and one for Spelling Bees (50 Latin terms and phrases). It took me about an hour and a half to master all three of these lists perfectly, which I've never succeeded in doing before. I'm sure Ron would have done it in a tenth of the time, but hey, I'm just a beginner! To do it, I had to be creative in using the ideas in Ron's system - I mean, you can't expect a course to give you a specific memory scheme for every conceivable list in the world - but I never would have thought of the tricks I used to achieve this if I didn't have this clever method in front of me. Of course, if you decide to visit Ron's website yourself, and give it a test drive, I'll consider trading lists with you!